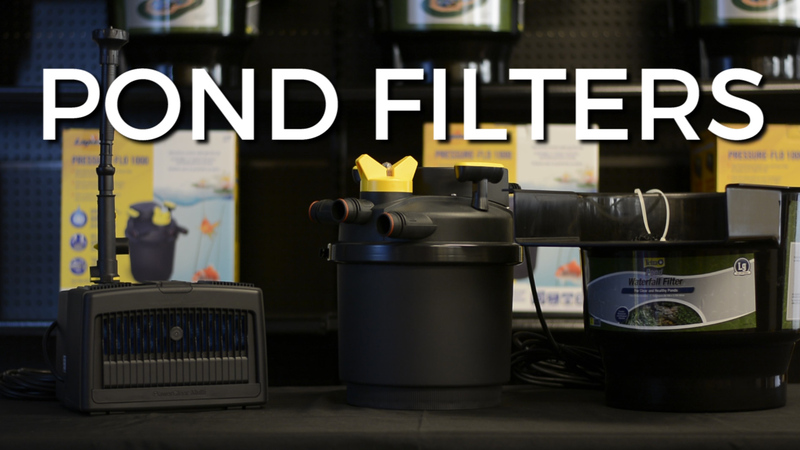 POND FILTERS | 3 Main Types There are basically only 3 types of filters- submersible, gravity fed, and pressurized. Today we're going to briefly go over these three styles. All ponds with fish, will require some level of filtration. Choosing the proper filter is dependent on many things – pond size, pump size, number of fish, hours of sunlight, percentage of plants, etc. I know – it’s a lot and it can be confusing but, there are basically only 3 types of filters- submersible, gravity fed, and pressurized. Today we’re going to briefly go over these three styles. Gravity Fed- These are some of the most cost effective and low maintenance systems available. Water from the pond is pumped into an inlet of the filter where it then fills from the bottom up, flows up through the internal filtration media, and eventually returning to the pond via gravity. These units must be installed above the water level and are often positioned at the beginnings of waterfalls. Creating a nice wide stream at their start. Pressurized- With an external pressurized filter, the water is pumped into an inlet and exits still under pressure. These units can be installed anywhere around the pond and can be partially buried for easy concealment. Most have backwash capabilities making cleaning a breeze. Some even come with integrated UV clarifiers. With a variety of options available, choosing the filter that best fits your specific needs can be overwhelming- so please know that you can always contact us with questions. I’m Joe from webbsonline.